Zach Gibson/Getty ImagesUS President Donald Trump. President Donald Trump said he approves of Saudi Arabia’s acknowledgement and called it “a great first step.” An official statement from White House press secretary Sarah Huckabee Sanders echoed the same while offering condolences to Khashoggi’s family. Trump claimed that US jobs that could be created as a result of defence contracts with Saudi Arabia would be threatened if he took action against the Kingdom. Trump has earned some rebuke for appearing to give deference to the Saudis. President Donald Trump said Friday that he approves of Saudi Arabia’s acknowledgement that the Saudi journalist Jamal Khashoggi died inside the Saudi Consulate in Istanbul, Turkey. Trump called it “a great first step,” while speaking at a roundtable discussion with defence industry executives at Luke Air Force Base. An official statement from White House press secretary Sarah Huckabee Sanders echoed the same while offering condolences to Khashoggi’s family. On Friday, Saudi Arabia admitted that Khashoggi, a Saudi national who was had been living in Virginia as a legal US resident with a green card, was killed after an encounter with Saudi agents at the consulate “led to a quarrel and a physical confrontation.” That admission on Friday followed nearly three weeks of conflicting statements from the Kingdom and from Turkish officials. Khashoggi was an outspoken critic of his country and the crown prince, and reportedly feared for his safety before his disappearance on October 2. Other Saudi media reports suggested Khashoggi was interrogated and eventually died in a chokehold as a result of a physical struggle. Turkish authorities long suspected the Kingdom had orchestrated the killing, citing recovered audio recordings. Despite Saudi Arabia’s admission, Trump stopped short of calling for swift action against the country. Sitting among a group of leaders from the defence industry, Trump said he was hesitant to nix US defence contracts with Saudi Arabia. The kingdom has spent almost $US90 billion on arms since 1950 and has been a top buyer of US defence contracts. “We have a tremendous order,” Trump said. Trump has continued to lay claim to $US110 billion worth of defence trade deals with Saudi Arabia, without noting they have been merely “memorandums of intent” to fill that amount in the next 10 years. 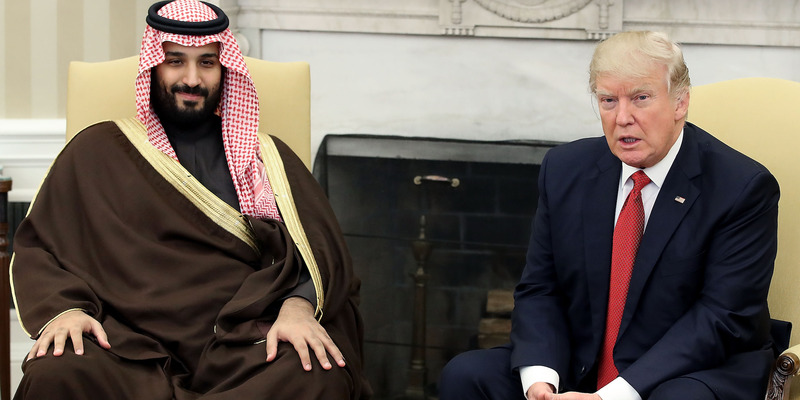 Trump, who has been under scrutiny for his financial ties to the kingdom, said on Thursday that there would be “very severe” consequences if Saudi Arabia was discovered to be responsible.